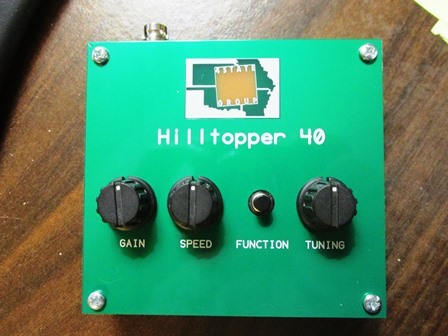 Many thanks to Pete (WB9FLW) who notes that the Four State QRP Group is now shipping the Hilltopper 40 transceiver. Dave Benson K1SWL, founder of the renown Small Wonder Labs, listened to you and has designed a 40 meter version of his winning Hilltopper design. Four State QRP Group is honored to have been selected to kit the new transceiver. The Hilltopper is a high performance CW transceiver for the 40M meter band. It is the perfect solution to your portable operation needs – small, lightweight, wide 40 meter frequency coverage and low current drain, extending the life of your portable power source. The receiver is adapted from K1SWL’s SW+ Series with minor modifications. The front-end circuitry was revised to replace the now-vanished 10.7 MHz IF transformers. The receiver output is suitable for headphone use. The transmitter strip is a proven design using three BS170 transistors for the PA. The frequency source for both transmitting and receiving is a DDS VFO employing a Si5351 PLL module. Control for the rig is provided by an Atmel ATmega328P. This runs both the frequency control and the full-featured CW keyer. A custom silk-screened PCB enclosure is included with the kit. No drilling or cutting required! There are two pre-installed SMT ICs on the board, but the remainder are ALL THROUGH HOLE parts, and all jacks and connectors are board mounted, the combination making this kit very easy to assemble with no external wiring needed. Click here to check out the Hilltopper 40. This entry was posted in CW, Kits, News, QRP Radios and tagged Dave Benson (K1SWL), Four State QRP Group, Hilltopper 40, Pete (WB9FLW). Bookmark the permalink.